Forklift Training Courses Calgary - Our forklift operator safety training has been customized for illiteracy, thereby cutting the training time by 50%. 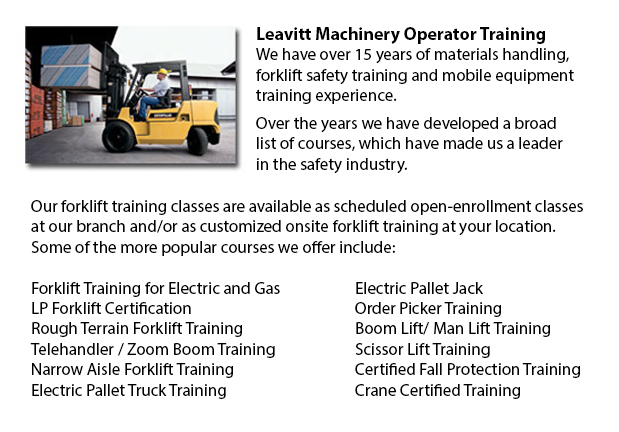 We provide lift-truck operator driver safety training evaluation, train the trainer and forklift training certification courses provide regulation-compliant, thorough training in industrial-powered fork truck safety and utilization. Forklift pedestrian safety is provided as well. We have a really experienced group of expert trainers to be able to make certain that your workers are well-trained. The certification is delivered on site by one of our certified instructors. People training will know how to identify dangers and carry out safety checks necessary for the safe and effective utilization of a powered industrial lift truck. It is essential that all workplaces using forklifts have the checklist below or one equivalent on the premises. If all of the safety rules are being followed, each of these questions should be answered with a "yes". A "no" to any question indicates a procedural flaw which can result in accident, injury or damage to machinery. 1) Is the operating area of the forklift separate from the traffic of pedestrians? 2) Is access by pedestrians to forklift areas restricted by a barrier? 3) The pedestrian walkways well-marked? 5) Are mirrors for drivers and pedestrians provided at blind spots? 6) Are alterations to daily lift truck schedules communicated to all affected employees? 7) The lift truck tires being used are suitable for all operating surfaces? 10) The maintenance schedule of the forklift is being followed? 11) Are yearly checks of the forklift being carried out? 12) Is the kind of forklift appropriate for the job? 13) Is there a load chart that is readable on the forklift? 14) Could the operators read and understand the load chart? 15) The chart lists the safe lifting capacity for all attachments and their uses? 16) Are the warning devices on the forklift working correctly? 17) The speed operating control device is secured properly? 18) Is overhead cage fitted correctly on the forklift? 19) Have all forklift operators acquired certification? 20) Speed limits and warning signs are being observed? 21) Are lift truck operators up to date on training for all types of forklifts being used? 22) Forklift operators understand their responsibilities to report the damage to the machinery and other lift truck accidents? 23) Prior to the machinery being operated, the pre-test checklist is being reviewed daily?